Four months ago, I returned to live (and work) in one of my favorite cities, Minneapolis. In the past six years, I earned my MBA, met many new friends, studied abroad in China and Chile, worked for two amazing brands, traveled the country and lived in Chicago. I visited many times since 2005, though Minneapolis is not the same as when I left. Though, neither am I.
It’s the first time in 12 years that a geographic move doesn’t mean starting over. That’s why 2012 is a year of rediscovery. … and all things familiar and new. I hope to share stories along the way and a photo from each day (while becoming a better photographer.) 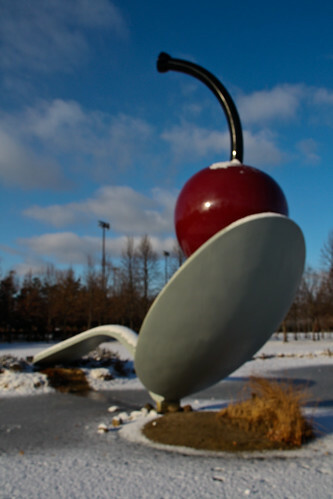 The photo above is the popular Spoonbridge and Cherry in the Minneapolis Sculpture Garden. Is it my best photo? Certainly not, but my hands were freezing, so this is the shot. The symbolism though is fitting for my year of rediscovery, which I’ll be taking one day (and one spoonful) at a time.